Westport is aiming to have zero impact on the enviroment by 2050. A pettion has been set up online for residents to sign. WESTPORT — While climate change remains a partisan concern in national politics, in Westport, combatting global warming has received steadfast bipartisan support in a community that attempts to be ahead of the curve. 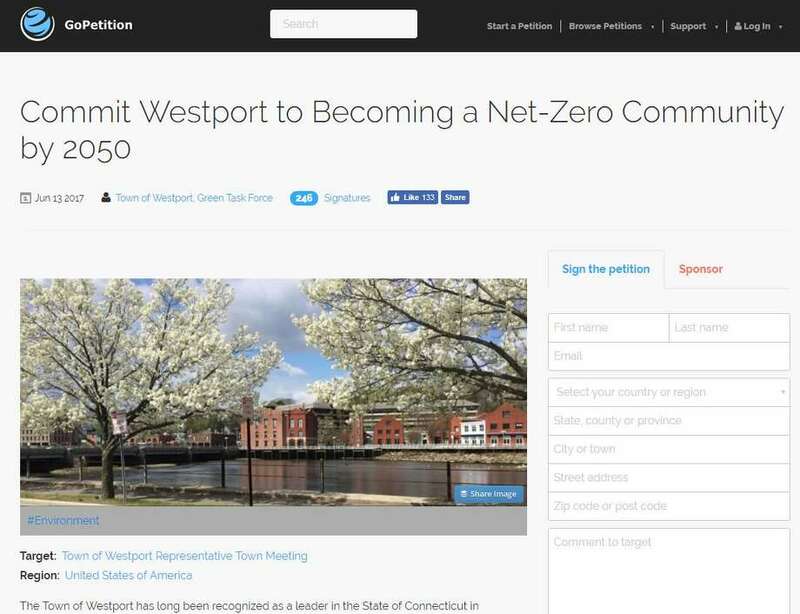 In the community’s latest effort, over 300 citizens signed a petition for town representatives to commit Westport to being a net-zero community by 2050, meaning no net impact on greenhouse gas emissions, water quality or waste creation. After President Donald Trump withdrew from the Paris climate agreement earlier this summer, mayors across the country expressed their intention to remain committed to its goals. First Selectman Jim Marpe joined a litany of mayors, states, universities, colleges and businesses in signing “We Are Still In,” a petition committing signees to continuing climate action and achieving the Paris agreement’s goals, in particular holding temperature warming below 2 degrees Celsius. Marpe also committed to the net-zero goals, and Green Task Force members see the next step toward their aspirational sustainability objective as a Representative Town Meeting endorsement to express consensus about the townwide goal and encourage individual citizens, business and town entities to work toward the objective as they see fit. Nearly 250 online signatures, 75 additional names inked in person, nearly 150 Facebook likes and letters of support from the Westport Public Library, Westport Historical Society, Earthplace, Westport League of Women Voters, Westport Arts Center, Levitt Pavilion, Wakeman Town Farm and Westport Garden Club concur. The petition has attracted signatures from town officials and residents alike, including both candidates for this fall’s first selectman race, Republican Marpe and Democrat Melissa Kane. The signatures were collected leading up to a July 11 RTM meeting, when discussion on the petition was postponed. It has been referred jointly to the RTM’s environmental and finance committees and is expected to go before the RTM early this fall. He noted the petition is not intended to make a political statement, but has lined up with Trump’s decision to withdraw from the Paris climate agreement. He said Westport, among many localities, does consider itself in line with the accord’s objective. The petition urges the RTM to pass a Sense of the Meeting Resolution resolving to make its “best efforts” to become net-zero by 2050 in terms of energy, water and waste and by using approaches that make economic sense, offer social benefits and are responsible for the environment. It defines net-zero greenhouse gas emissions as increasing Westport’s efficiency to reduce energy use and producing or buying sufficient clean energy for the community’s use. Net-zero water indicates ensuring the quality and availability of water, and net-zero waste refers to minimizing waste and recycling in order to send no waste to landfills. In its adoption of net-zero community goals beyond sustainable energy use — also striving for sustainable waste and water goals — Westport is ahead of the pack in Connecticut. Task force vice chairwoman Pippa Bell Ader, who works on statewide environmental initiatives, said a group of Connecticut towns is working toward relying completely on renewable energy, including Westport. But Westport is the first town she knows of that is going beyond support from elected officials to strive for a community endorsement of its trio of net-zero goals. The community’s net-zero emissions goal could also help Westport keep up with state expectations, Bell Ader said. Gov. Dannel P. Malloy implemented an act to address global warming that includes the goal of reducing greenhouse gas emissions 80 percent by 2050 from a 2001 benchmark and interim goals are expected imminently, she said. Mann said combatting climate change has been part of the community’s firmly held beliefs and Westport has long been a leader in sustainability and green initiatives. Two years ago, the goal of net-zero by 2050 began being incorporated into the town’s budgeting process, among efforts.